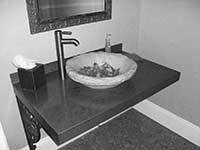 Get your Stainless Steel samples here Rachiele sinks made in the USA I hope you will consider joining our family of custom sink owners. I look forward to working with you. All of our stainless is made in the USA. We have regular certifications that indicate the purity and the fact it is domestic. That is not likely the case with most other stainless sinks! Your order will go out via Priority USPS or UPS the same day as ordered if at all possible. Considerably more Resistant to Acid Solutions, Chlorides, Bromides, Iodides and Fatty Acids at High Temperatures. Type 316 Contains Molybdenum and is Required in the Manufacturing of Certain Pharmaceuticals in Order to Avoid Excessive Metallic Contamination. Medical tools and some Implants are made of 316 Stainless due - often referred to as Surgical Stainless Steel due to its Resistance to Harsh Corrosion. Resistant to Chlorine (You should never put Bleach in ANY type 304 sink! - just Google this, you will see this is a Fact!) Use Bleach safely in our sinks. Can be Used in an Outdoor Installation without Worry. Homes in Coastal Areas with Salt in the Air will Benefit from Type 316 Stainless - no Fear of Rusting or Corroding. This is the typical stainless finish you see on many sinks and most stainless appliances. Easy to scratch, difficult to repair scratches. For that reason, this is the most labor intensive stainless for us to work with - hence a higher premium. After a while, scratches blend and form a nice uniform patina. This type of stainless can be hammered if you like. I think that option looks terrific. Past customers have told me their several year old sinks look virtually new. Benefits: Does a great job at hiding scratches and water spots. Easiest to care for. Millennia is a textured stainless steel that has been quite popular. FYI, this material is much more expensive than copper. It's worth it though! I have one in my home that is 16 years old and it looks new! If you have a contemporary or eclectic look in your home. this will be a gorgeous addition. (New for 2012. I came up with this idea a while ago.) Nothing is worse than getting a scratch on the front of a brushed stainless farmhouse sink. There is no easy fix. In fact, if you try, you will likely make matters worse. The same goes for the inside of a brushed stainless sink. I came up with this finish to solve those issues. 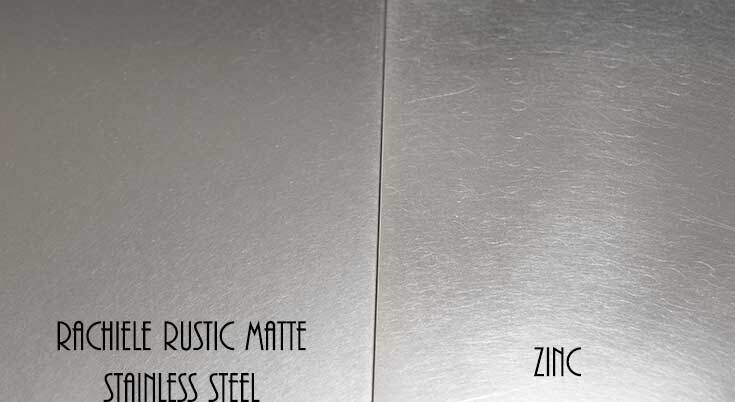 When you scratch this stainless finish, it is simple to remove the scratch at home and blend in the finish to look much like the original finish. 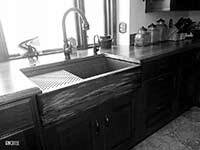 In fact, the process is very fast if you order a hammered Rustic Matte sink. 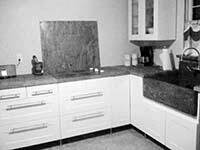 The end result looks much like Zinc - without the pitfalls of using Zinc for a sink or counter top. I am sure you are aware zinc is very soft and will dent easily and can warp out of shape easily. My Exclusive NexGen design in Rustic Matte Stainless. 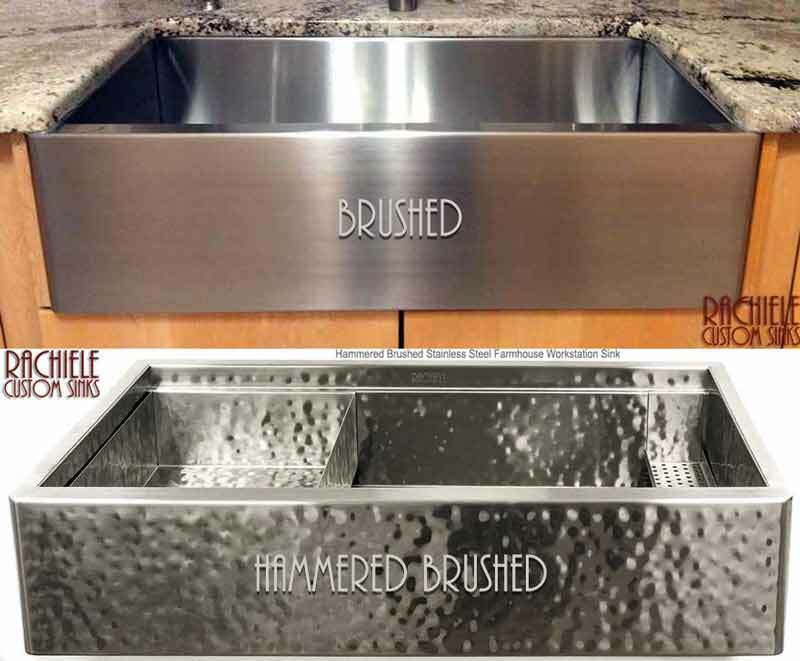 We buy unfinished stainless and apply our own finish - the last step we apply a hand rubbed finish using a red Scotch Brite pad to achieve a soft matte rustic look on the stainless steel. Just buff out minor scratches and blend in with the original finish using the Scotch Brite pad I send along with every sink. This type of stainless can be hammered. It is easily my favorite look as far as stainless goes. 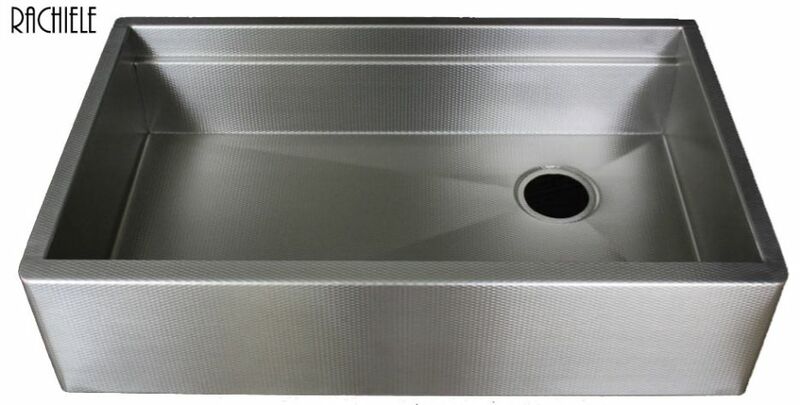 The Finest Quality, Best Engineered, Stainless Steel Sinks in the World. Shop Now!